NOTE - We have detected that you are browsing our site from the USA. WinnerPoker.com does NOT accept poker players located in the USA. To play online poker, please view our list of the best USA poker sites. William Hill is one of the oldest and largest bookmaking companies in the UK, established almost 80 years back. With extensive operations in the UK, Ireland, Bulgaria and Israel, the company boasts of more than 2,300 retail shops and provides employment to over 15,000 people. Besides bookmaking, the company also offers various casino and poker games. A decade back, the company made the shift online with their first online bookmaking site and various casino and poker games. 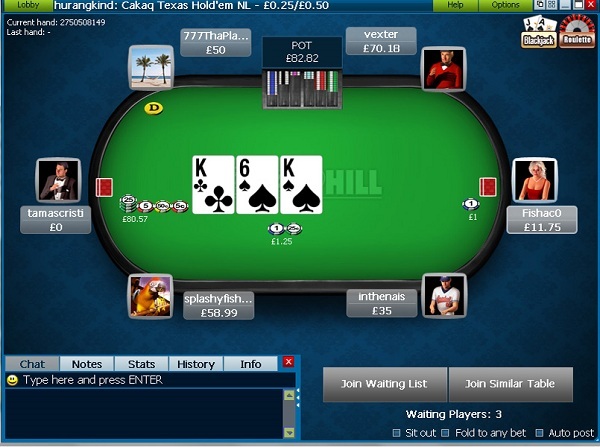 William Hill Poker was launched about the same time and is one of the most popular online poker rooms. William Hill is offering a fantastic promotion for new depositing players. Join through our site and use the William Hill coupon code TOPBONUS and receive a 200% bonus up to $1000 / €650. The bonus is available in a variety of currencies including Euros, Pounds and CDN. William Hill also provides regular promotions for their online sports book, casino, bingo room and games room. for a 200% up to $1000 / €650 Bonus! Part of the iPoker network, the site boasts of an incredible amount of traffic and is especially popular among European players. The poker room operates under a license from the Government of Gibraltar and is closed to players from the US. Players can find at William Hill Poker the most popularly played poker games online. The games at the site are designed by Playtech, a renowned name in online gaming software. Further, the site has enforced strict measures to ensure that nobody under the minimum age of 18 is allowed to enter the poker room. Compulsive gambling is also discouraged, by imposing strict deposit limits. A really great thing about playing at William Hill Poker is the bonuses offered. Every player that has newly registered at the site gets a 200% bonus on their first deposit, up to a maximum of $1000 / €650. To have the bonus money transferred to their accounts, players must earn a certain number of points required by playing real money games. Also with the first deposit, players are given entry into two weekly freeroll tournaments. Besides these you have the common bonus programs like the Refer A Friend bonus, where for each friend recommended to the online poker site, both the player and the friend are awarded a bonus of $50 each. Also for each hand played, players earn a certain amount of comp points which can be redeemed for real money. The games at William Hill Poker are powered by Playtech, which is also a member of the iPoker network. Being one of the leading names in the gaming software business, Playtech has offered some feature rich games for the enjoyment of players. The games at William Hill have features like 3D graphics, customization options, player statistics, hand history and quick seat. One of the key advantages of the games here is that they run fast and smooth irrespective of the traffic present and how many games you are playing simultaneously. At almost 12 MB, downloading the software is easy and does not take much time. While the downloadable version is available only for windows users, Mac and Linux users can use the onsite version of the games, without any loss in quality. William Hill hosts one of the biggest tournaments ever online, with prizes worth 13 million dollars and tournaments being played every day of the week. The Guaranteed Tournaments offer the biggest cash prizes, starting from $30,000 and going up to $250,000. Another popular tournament is the Monster tournament, offering prizes from $20,000-$40,000. Besides the tournaments, you have the freeroll games with daily, weekly and side freeroll games. You can also find freeroll games like beginners’ freeroll and VIP freeroll. The freeroll games can be played with the comp points earned by playing the normal poker games. Being a UK based poker site, William Hill poker has a large chunk of traffic from the UK alone. But the site also enjoys great popularity among the European poker enthusiasts. The peak hours in Europe is the time when the site has the most traffic. At peak hours, the site boasts of traffic around 10,000 players at ring games and above 50,000 players at tournaments. During this time, the tables are also filled up very quickly, making it very easy to get a poker table. Like most reputed online gambling sites, William Hill offers very convenient banking options. The options for making deposits are more than those for withdrawals. The online poker room accepts deposits through Visa, Visa Electron, MasterCard, Delta, Maestro, PayPal, Neteller, Moneybookers, Ukash, Paysafecard, ClickandBuy, Entropay, Click2Pay, Diners Club, Moneyclub, Quickcash, eWire among others. Deposits through bank transfers are also accepted. For withdrawing winnings, the options are limited to Visa, Visa Electron, Delta, MasterCard, Quickcash, Neteller, PayPal, Moneybookers, Click2pay and ClickandBuy. The time taken for a transaction varies depending on the method used, from instant to 3-5 working days. Transactions are done largely in pound sterling, euro and US dollars. One of the biggest strengths of William Hill Poker is the excellent customer support that they give to their clients. Players are offered customer support 24/7 and through a number of options. The customer service center at William Hill Poker can be contacted via telephone, fax, live chat and email. In order to avoid the task of contacting a customer service center, players can browse through the FAQ section of the site, where players can find an answer to their queries. Apart from the customer service, the security offered at William Hill Poker is also of the highest quality. The site has installed state of the art equipment to ensure that all user information remains secure. The online poker site is certified by VeriSign, which ensures that all monetary transactions between the player and the poker server remain safe from hackers. Also, the RNG (Random Number Generator) of the site, which serves the function of ensuring that results in all games are random and fair, is TST (Technical Services Testing) certified, which means that the RNG is of the highest quality. Staying true to its decades-long reputation as one of the leading bookmakers in the UK, William Hill has created one of the best poker sites on the web. William Hill Poker is highly recommended for both new players and professionals looking to make some serious money. Ready to Play? Visit William Hill Poker to Get Started Now! Are you ready to join William Hill Poker? Don't forget to use our exclusive bonus code TOPBONUS to lock in your 200% to $1000 deposit bonus. Other available promotions include; daily freerolls for new players, a brand new VIP rewards program that pays out cash and access to some of the top tournaments on the net.